Black holes are famous for being ravenous eaters, but they do not eat everything that falls toward them. A small portion of material gets shot back out in powerful jets of hot gas, called plasma, that can wreak havoc on their surroundings. Along the way, this plasma somehow gets energized enough to strongly radiate light, forming two bright columns along the black hole's axis of rotation. Scientists have long debated where and how this happens in the jet. Astronomers have new clues to this mystery. Using NASA's NuSTAR space telescope and a fast camera called ULTRACAM on the William Herschel Observatory in La Palma, Spain, scientists have been able to measure the distance that particles in jets travel before they "turn on" and become bright sources of light. This distance is called the "acceleration zone." The study is published in the journal Nature Astronomy. Scientists looked at two systems in the Milky Way called "X-ray binaries," each consisting of a black hole feeding off of a normal star. They studied these systems at different points during periods of outburst — which is when the accretion disk — a flat structure of material orbiting the black hole — brightens because of material falling in. "One possibility is that the physics of the jet is not determined by the size of the disc, but instead by the speed, temperature and other properties of particles at the jet's base," said Poshak Gandhi, lead author of the study and astronomer at the University of Southampton, United Kingdom. This expanse of about 19,000 miles (30,000 kilometers) represents the inner acceleration zone in the jet, where plasma feels the strongest acceleration and "turns on" by emitting light. That's just under three times the diameter of Earth, but tiny in cosmic terms, especially considering the black hole in V404 Cygni weighs as much as 3 million Earths put together. "Astronomers hope to refine models for jet powering mechanisms using the results of this study," said Daniel Stern, study co-author and astronomer based at NASA's Jet Propulsion Laboratory, Pasadena, California. Making these measurements wasn't easy. X-ray telescopes in space and optical telescopes on the ground have to look at the X-ray binaries at exactly the same time during outbursts for scientists to calculate the tiny delay between the telescopes' detections. Such coordination requires complex planning between the observatory teams. 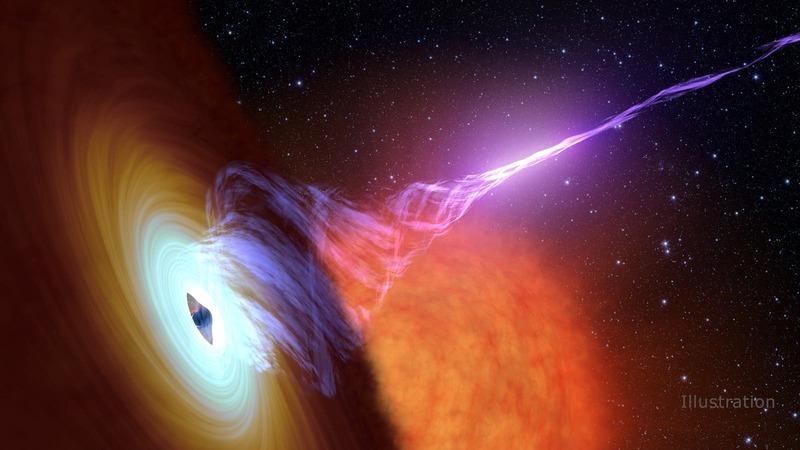 In fact, coordination between NuSTAR and ULTRACAM was only possible for about an hour during the 2015 outburst, but that was enough to calculate the groundbreaking results about the acceleration zone. The results also appear to connect with scientists' understanding of supermassive black holes, much bigger than the ones in this study. In one supermassive system called BL Lacertae, weighing 200 million times the mass of our Sun, scientists have inferred time delays millions of times greater than what this study found. That means the size of the acceleration area of the jets is likely related to the mass of the black hole. "We are excited because it looks as though we have found a characteristic yardstick related to the inner workings of jets, not only in stellar-mass black holes like V404 Cygni, but also in monster supermassive ones," Gandhi said. "Global ground and space telescopes working together were key to this discovery. But this is only a peek, and much remains to be learned. The future is really bright for understanding the extreme physics of black holes," said Fiona Harrison, principal investigator of NuSTAR and professor of astronomy at Caltech in Pasadena.